Here is a simple map. The map is based upon the online community lifecycle. Over the past few decades the lifecycle has been developed by academics, refined by practitioners and perfected by us. There are four stages to online community development. These are inception, establishment, maturity and mitosis (there is death too, but lets skip that for now). The inception stage of the online community lifecycle begins when the organization or individual begins interacting with their target audience and ends with the community achieving a critical mass of activity. During this phase of the online community lifecycle, the community manager focuses upon a few very specific tasks. 1) Inviting members to join and keeping them active/engaged. 2) Initiating discussions and prompting members to participate. 3) Building relationships with members (individual outreach). 4) Writing content about the community. 5) Hosting a regular online event. The goal for the community manage at this stage is to provide the initial momentum and nurture the growth and activity until it has become self-sustaining. Using the metrics below, we can identify exactly what is needed to reach the next stage of the online community lifecycle. You can read more about this stage in our free Proven Path eBook. The establishment stage of the online community lifecycle begins at the critical mass phase and ends when close to 90% of growth and activity is being generated by members, and when there is a limited sense of community amongst members. 3) Writing content about the community. 4) Building relationships with key members. 5) Initiating discussions and prompting responses. 6) Organizing a regular event/activity. 9) Collecting and analyzing data. Note the subtle shift from one phase to the next. Tasks should gradually change. There should not be an abrupt change. The maturity phase begins when 90%+ of activity/growth is being generated by members of the community and ends when activity/growth is self-sustaining and there is a very highly developed sense of community. Precise metrics here are somewhat variable. However, at a broad level we will see a plateau in membership growth, sustainably high levels of activity per member and a highly developed sense of community. 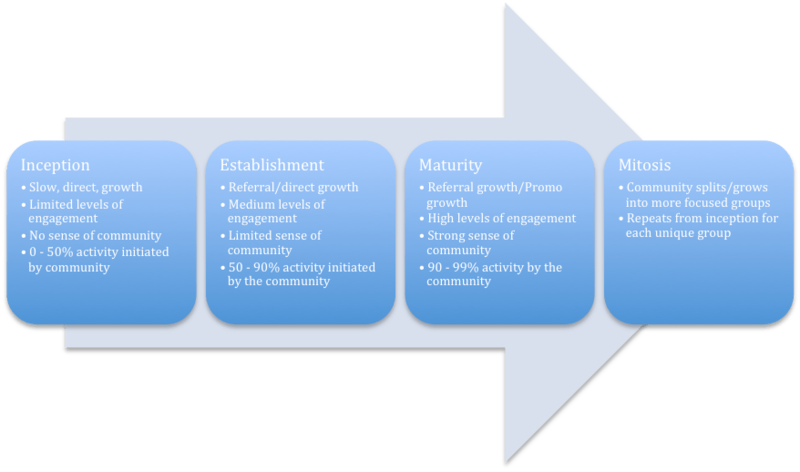 Most of the successful online communities we see today are in the maturity phase of the lifecycle. During this phase of the online community lifecycle, the community manager will focus upon scaling the community (e.g. recruiting volunteers), optimizing the processes, developing a strong sense of community, and ensuring the community is highly influential within it’s ecosystem. 1) Stimulating referral and promotional growth in the community. 4) Developing a sense of community (shared history, exclusivity, stronger personality, achievements/wins). 5) Optimizing the platform and conversion/activity metrics. 6) Big wins– causes, missions, unifying activities. The mitosis phase begins when the community is almost entirely self-sustaining and ends when it has broken into smaller, more focused, online communities. Not all communities progress to this phase. Many are fine in the maturity phase. The mitosis phase is important. Many community managers let their community grow too big and too active. Beyond a certain level of activity, it becomes difficult for all members to believe they can influence the community. Members no longer feel a genuine sense of connection with another member. Why do villages have a strong sense of community and cities so weak a sense of community? Once you reach this stage, the number of participating members begins to drop. A smaller number of ever-more dedicated members will account for an increasingly large amount of activity. During this stage, one group of members who have developed relationships with each other will account for the majority of activity within a community. They will crowd out all other groups. Newcomers will find it more difficult to find their place within the community. Over the long-term, this will lead to drastic participation inequality ratios. The solution is to subtly break your community into smaller groups based upon friendship circles which have formed within the community, or upon more specific shared interests. Most communities are based around a shared interest e.g. a community for teachers, a community for people that love collecting coins etc… Once too many members join, the community manager may create places in the community for a second qualifier. For example, an area of the community for History Teachers or an area for coin collecting in Washington DC. A community can be broken along demographic, habitual or psychographic lines (who members are, what they do or what they think/feel). You can identify particular issues and break the community along those lines. Each group should be initiated one at a time and then promoted until it's sustaining itself. Don't create too many groups too soon. In essence, each group then begins at the inception phase and will require promotion and support until it becomes self-sustaining. How much time should you spend on each element? How do you know what stage of the lifecycle you’re in? Now we need to know how to identify where our communities are on the lifecycle. We do this by triangulating (great word!) three different development metrics; growth, engagement and sense of community. By growth we’re talking about the increase (or decrease) in the number of active members in the online community. Note the word ‘active’ in that previous sentence. Too many community managers cite the number of registered members in their community. We want to measure the number of active members. This figure is more useful. It’s a figure that both goes up, and most importantly, can go down. If we’re doing a worse job that last month, and the number drops, we can quickly realize we have a problem and take appropriate measure. And, of course, it lets us track where we are on the community lifecycle. To ascertain the growth of a community, we use a simple metric. There is a big difference between 1000 members who make 1 contribution a month and 1000 members who make 50 contributions a month. The latter are clearly more engaged in the community. The more engaged members are in the community, the more developed the community is. The more engaged a community is, the further it is along the community lifecycle. It’s easy for the community manager to get more people to join the community. It’s not too difficult to get them to participate once or twice a month, but it's more difficult to get members engaged over the long term. Using these four metrics we can develop a fairly comprehensive idea of how engaged the community is at any particular time. Also, through the use of these metrics, we can spot potential issues before they become fatal issues. If, for example, the number of respones to a discussion begins to plummet, we need an intervention to subtly influence the community towards discussions likely to get a bigger response. The third element of our data trio is the sense of community. It’s important to track the sense of community in your community. A community can have a good level of growth, high levels of engagement but fail to develop relationships between members. This is the case for many customer-service based communities. In 1999, Chavis et al produced the Sense of Community Index. This is a tool for measuring the sense of a community within a given area. It is in survey-form, which means members need to be invited to participate. However, this is based for geographic neighborhoods, we need an online index. Fortunately Anita Blanchard has produced the virtual sense of community index based upon the existing SCI (sense of community index). It is this virtual sense of community index which we need to use to measure the sense of community. However, there is a limit to how frequently they can be used. Asking members to undertake the same survey every month will cause fatigue and possibly irritate members. Therefore, we either need to measure a small sample of the total members each month and rotate the people being approached every month, or we need to measure the sense of community at less frequent intervals, for example 6 to 12 months. Whilst the later approach might be easiest, it’s also problematic. Problems in the community might not emerge for some time. In addition, even these time frames can irritate members. Therefore, it is best to develop several unique segments of members stratified upon their date of registration (and continuous) and survey these members. Be aware, also, of a potential response bias. Those that respond easily are likely to be those that are also most engaged and feel a stronger sense of community. It is equally as important to collect the data from the less engaged members. This might include sending reminders to members (or incentivizing members) to complete the survey. By reviewing these three data points (growth, engagement and sense of community) every month, you can identify exactly where your community lies in the lifecycle. This tells you where you are now. Then you can apply the table above to know how much time you should spend on each element, and look to see which tasks you should be participating in. For example, if you're a community in the establishment phase with solid growth and engagement, but a weak sense of community, you need to prioritize those sense of community elements (specifically the ones you're missing), to develop the community (you can learn how here - /2011/10/senseofcommunity.html). You can also spot potential problems. If engagement or growth is suddenly declining, you can stage an intervention before you enter a terminal decline. Once you identify where you are, you can then identify your prioritize using the % chart and figure out which of the activities listed in each section you need to implement to further develop your community.